It doesn’t really matter what time of the day it is when you go to visit Taj Mahal; you know it’s going to be an experience to remember and share. 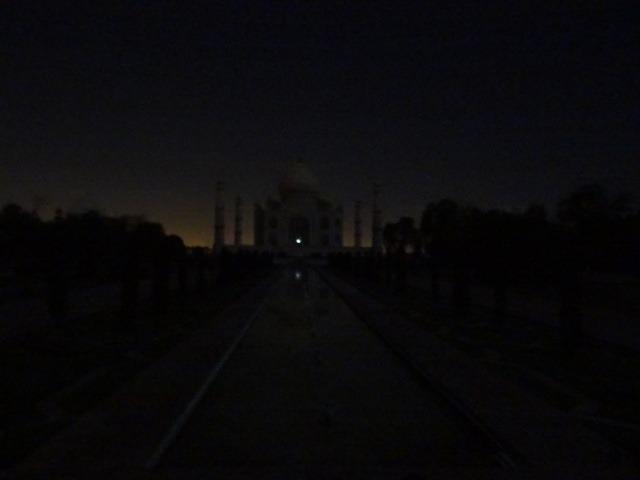 But looking at Taj on a silent night when the moon is at its full glow is a much talked about moment and recommended by almost everyone to go visit the fabulous Taj mahal when the sun is down. 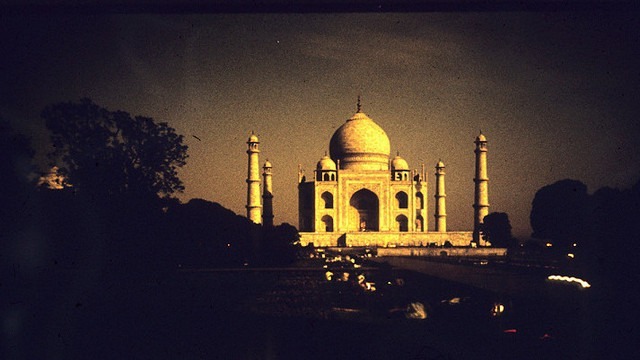 People say that’s when rays of the moon light up the entire monument and lend it a faint silvery glow with Taj Mahal gleaming like a polished diamond under the moonlit sky. The night viewing of Taj Mahal wasn’t allowed till few years back due to many bombing threats by terrorists, but in 2004 the government lifted the 20 year-long ban and allowed for 5 nights in a month i.e. on the full moon night, two days before it and two days after it, except on Fridays or the month of Ramzan. The night viewing is opened for four hours from 8:30 PM to 12:30 AM, for maximum of 400 people per day divided into eight batches of 50 people for duration of 30 minutes only. 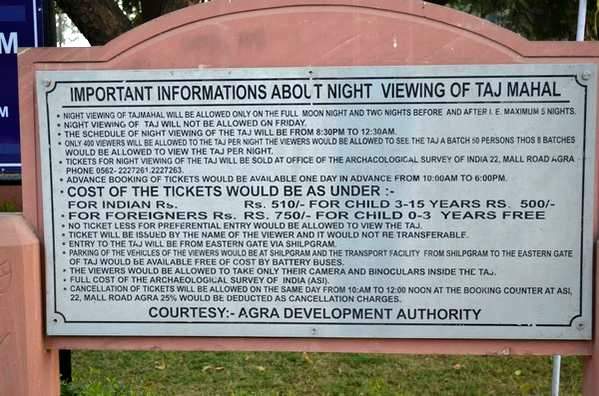 The tickets for the night viewing of the Taj Mahal can be purchased one day (24 hours) in advance of the date of night viewing from the booking counter located in the office of the Archeological Survey of India, Agra Circle, 22 The Mall, Agra, in between 10:00 AM to 6:00 PM. Make sure to take valid passport photocopies with you to buy tickets else you will be refused. The tickets can also be cancelled at the above location on the same date of viewing before 1 PM with cancellation charges of 25% per ticket. Tourists must reach at Shilpgram (near Eastern gate of Taj Mahal) half an hour before the scheduled time mentioned on their tickets for security checks. You will fantasize that this experience will be the height of romanticism. You’ll imagine yourself wandering on the green grass grounds with hand in hand along with your partner, seeing the moon and the Taj reflection in the water, taking pictures that will be the reason to envy for everyone back home. Now here comes the reality check. First, after a heavy security check and battery operated bus ride from Shilpgram to Taj entrance you don’t actually get to walk on the grounds; you’re kept back at the main entrance gate of red sandstone. 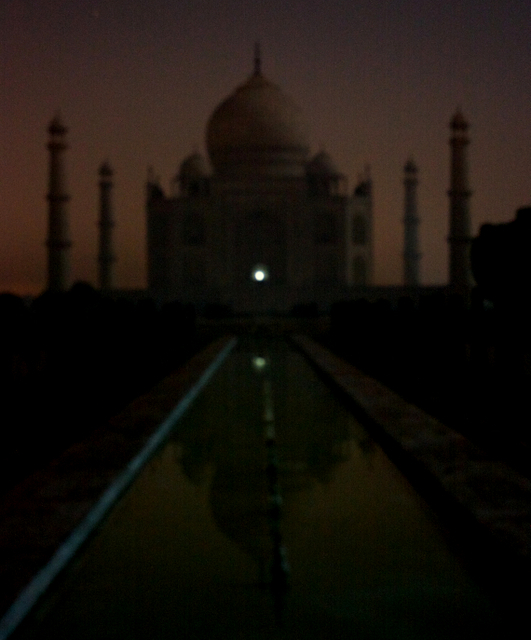 So all you can see is the Taj in the distance beyond all the reflecting pools and garden. The rule is tourists can view the Taj Mahal from a distance of 500 m, from a nearby red sandstone platform and tourists are permitted to carry still cameras only for photography and binoculars for viewing. So don’t think of getting a video of your much fantasized visit. Second, if you come in December through February, that’s the season of the fog/smog in Agra. Since you have to buy your ticket a day in advance, you can only hope the weather will be good, which is mostly not the case. You are given a ticket for a certain half hour; and you need to arrive at least 30 minutes before of your mentioned time in your ticket. After 3 full body security checks Taj security screens your personal belongings and bags where they will take away all pencils, pens, cosmetic lotions, books, etc., etc., from your bag which is really funny as you couldn’t even throw one of these items and hit the Taj from where you and the other 49 or so “tour” members stand during the 30 minutes tour. Then you look up through the fog/smog and see the moon is actually behind where you’re standing (not picturesquely over the Taj or even the grounds). And as you try hard to strain your eyes to look through the fog/smog, in the distance, you can barely make out the Taj–mostly you see just the tiny light of the lamp that hangs over the tomb. As you shiver in the cold and try to find the best setting on your camera in hopes something will show up other than the black photos, you will probably feel really exploited. On the ticket it’s mentioned the “tour” will be canceled if the weather doesn’t permit, so fog/smog doesn’t count, especially with all those tourists being shunted through every half hour. Same is the story about sunrise morning tours during December-January, as the fog/smog doesn’t lift until about 11 a.m.–certainly you won’t be able to see a sunrise while shivering and standing on cold white marble barefoot. Ticket Booking: Office of Archeological Survey of India, Agra Circle, 22 The Mall, Agra, in between 10:00 AM to 6:00 PM for one day advance. a) Tickets have to be purchased one day prior to the day of visit. b) Guests have to report at VIP parking area of Tajmahal – half an hour before the schedule time of visit given in the entrance ticket for security check and briefing. c) A group of 50 passengers are formed & taken inside Tajmahal up-to the first platform for a half an hour visit of Taj by moonlight. d) Video Camera & Mobiles are NOT allowed during the visit. b) Passport No, Date of issue, Date of expiry, place of issue. c) Date of birth, address of the guest. This entry was tagged Agra, India, Review, Taj Mahal. Bookmark the permalink. I think it is not fair to criticise the spectacular view of Taj Mahal in Moon light and at sun rise which are really recommendable to all coming to see the Taj Mahal….weather conditions can be an exception….in my opinion one should see the Taj Mahal both in day and night time if it possible, except the months of December and January when one should visit the Taj Mahal between 12:00-15:00 hours so as to have the sunlight during the visit…moonlight view is an added thing if you are in Agra…9 euros is what you pay to see the Taj Mahal at night….so rest assured you will not be disappointed for what you are paying…. Thank you Phoenix… Much appreciated !